ROCE stands for Return on Capital Employed; it is a financial ratio that determines a company’s profitability and the efficiency the capital is applied. A higher ROCE implies a more economical use of capital; the ROCE should be higher than the capital cost. If not, the company is less productive and inadequately building shareholder value. Capital Employed = Total Assets – Current Liabilities. Calculating Return on Capital Employed is a useful means of comparing profits across companies based on the amount of capital. It is insufficient to look at the EBIT alone to determine which company is a better investment. You also have to look at the capital and calculate the ROCE. Many consider ROCE a more reliable formula than ROE for calculating a company’s future earnings because current liabilities and expenses. Are you trying to maximize the value of your company? The first thing to do is to identify “destroyers” that can impact your company’s value. 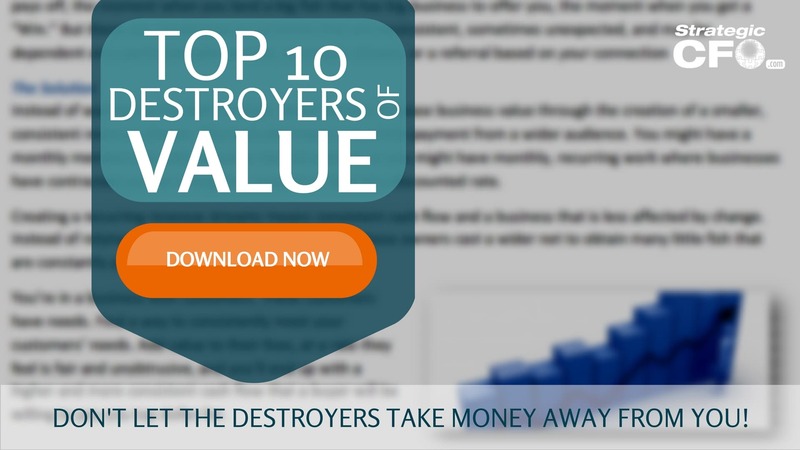 Click the button to download your free “Top 10 Destroyers of Value“. Look at the following table to see the importance ofReturn on Capital Employed (ROCE) in action. Both Company A and Company B sell computers. Company A represents the Old Factory model; they are a distribution company that sells business to business. Company B is the New Factory; they are also a distribution company, but they sell on the Internet via credit card. Due to this modern convenience, Company B is able to receive payment within two days instead of the forty-five it takes Company A. If you were to just consider EBIT, then Company A looks like the better investment at 7% return on sales compared to Company B’s 5%; however, with such a large DSO number, Company A is out $6,000,000 more than Company B at any given time. This means Company B needs less capital invested in the company which would result in a higher return on equity (ROE). Thirty years ago, a similar scenario played out between IBM (Company A) and Dell (Company B). In his college dorm room, Michael Dell started taking credit card sales over the phone and was able to grow a billion dollar company with very little capital. 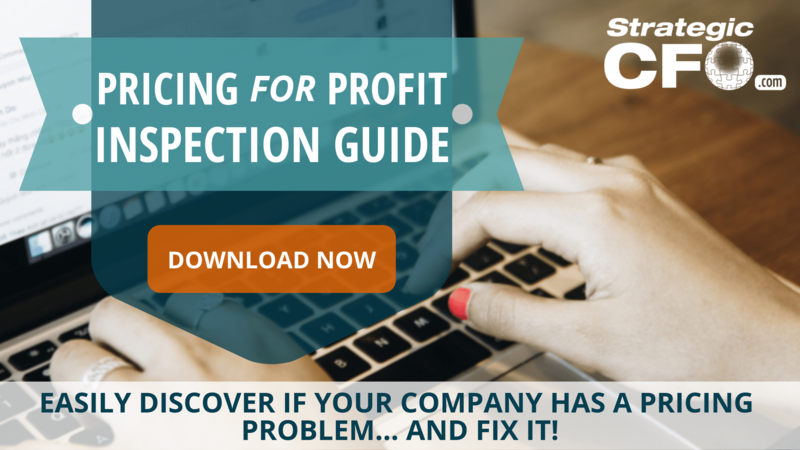 If you don’t leave any money on the table, then access our Top 10 Destroyers of Value to discover what areas of your business need to be attended to. Access your Exit Strategy Execution Plan in SCFO Lab. The step-by-step plan to get more value when you exit your company. At The Strategic CFO, we believe in the saying “You scratch our back, we scratch yours.” Everyone always sees other businesses as a competition; to some extent, they are. But sometimes, you just need to let people make money. As we’ve become more focused on optimizing technology, we have started to outsource tasks/projects to outside vendors nationally and, depending on the task, internationally. I was talking to my associate the other day, when we asked our vendor partner to help complete a project. She was concerned about pricing, and whether or not it was worth the money to ask our vendor to do the engagement. They charge about $25 per hour of assistance, and we needed easily 3 or 4 hours of advice. What happens when you need to cut costs while still maintaining the same value? Everyone knows that increasing revenue and cutting costs increases your bottom line. But are you actually maintaining that value or are you manipulating that? Let’s say you’ve already cut as many costs as you can, but you still need to cut more. This is where you have to make financial decisions… What do you value most – your profit or your relationships? Cutting costs doesn’t mean you have to cut out the relationship forever. In fact, unless they do something unforgivable or you won’t ever need them again, you should keep that relationship open. For example, our vendor doesn’t work with us 24/7. However, we still maintain the relationship by giving him tasks once every couple of months. They act as an extension of our team. Are you ready to unlock real value in your business? Click here to access our three best tools to unlock value! So how does Tinder connect to your business? n to another person, we would not receive the same value. Business would be done quickly and no relationships would be formed. Keep in mind that conducting vendor relationships is critical for your success. Think about that time when you needed help immediately… If you had a good vendor relationship, they would be able to fix the problem immediately as they already know your business. But if you were a habitual left swiper, then the new vendor would have to get up to speed… Slowing down your progress and leaving money on the table. Ultimately, when you treat vendors frivolously, you’re setting examples for other businesses. Soon enough, those vendors will go out of business because many businesses use the vendors inconsistently and constantly look for a “better deal.” And what happens when that business goes bankrupt? All of the value they put into your company is now gone. What you should really be doing is investing your money, time, and trust in one vendor per task. My associate ended up using the vendor she was skeptical about, because she realized that if she found a new vendor, we would have had to spend the time to get the new vendor up to speed and we would always be looking for someone better and cheaper. It’s a waste of time and time is money. There are 3 buckets of value: cheap, timely, and/or good quality. A business can expect to have two of the three when it comes to investing in something valuable, but not all three. This is where you come in as a leader… the best way to solve this problem is to find a compromise. Pick which bucket(s) you find more valuable. Use that as your foundation or guide to making vendor decisions. When I first started The Strategic CFO, I wanted everything cheap and timely because I believed in investing in something to get quality work in return. I was young and naive. Customers eat at fast food restaurants because it is cheap and timely, but it isn’t the best quality. Let’s even use the Tinder example… Constantly looking for new vendors is a cheaper and possibly faster. However, quality is built over time, and you won’t see consistent quality over time. So think about it… do you really want to compare your business to fast food or Tinder? If you like these stories and advice, we recommend you also check out our ultimate CFO resource! Unlock your value today! I was talking to my associate and she told me that she bought a makeup palette from China for only $6, when the price in the United States is $52.00. The only downside is that it took 2 months to get it in the mail! When she finally received it, it looked as if she bought it here in the US. The same concept can be applied to outsourcing tasks internationally, because of the time and language barriers. Sometimes we don’t see the work for 2 weeks to a month. This is good for tasks that don’t need to be completed right away, such as graphics for a future project. For this example, we can use salaries. If you look at your staff, they have to be timely and of good quality. That’s why salaries consume the majority of your expenses. This is because you invest in them for your company. If we started seeing vendor partner as valuably as we do staff, the timeliness and the quality of the work might actually pay off. In conclusion, you can’t treat businesses like a commodity, because they will treat you like a commodity. You can have cheap, timely, or quality work. You can expect two out of the three, but not all three. If you want to unlock value from vendor partnerships in your business, they need to know they are valued. How can we do that? Let them make money! If you want to learn more about how to add real value to your company, click here to access our 3 best tools AND learn more about The SCFO Lab.